Jaipur is the capital of Rajasthan state. The royal family once ruled the region in 1727, founded what is now called Pink City for its trademark building color. 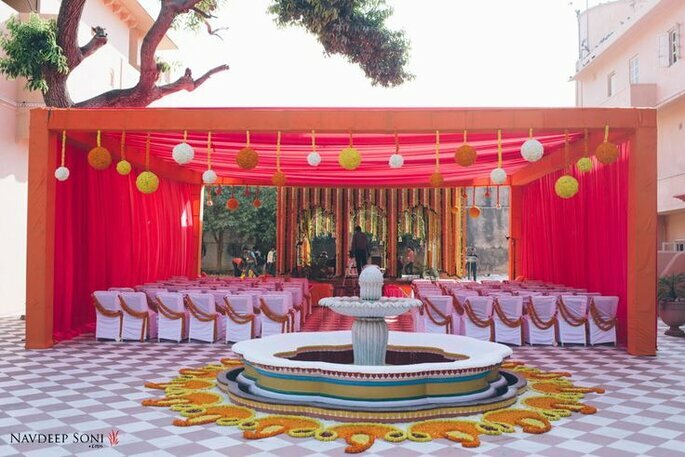 It is a new trend in the youth to have destination weddings and Jaipur is one of the most loving destinations for weddings and here are the top most beautiful wedding venues for your amazing destination wedding. A we dding day is not just a day for you and for your guests but it is a dream day for you and for your parents and most awaited day for your relatives. A wedding is not a just an occasion which just happens to you but wedding needs proper planning which includes destination and venues for most. 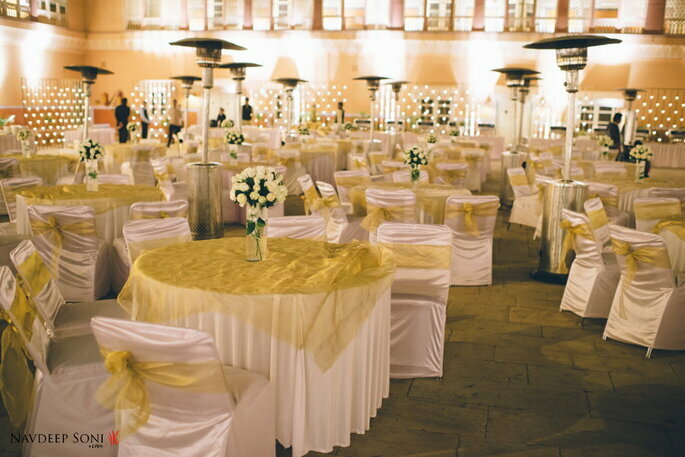 Chomu Palace is one of the best venues for your destination wedding with many options. Manohar Garden is the pathway to the main entrance of the Manohar Bagh lies within its main lawns, with fountains in the pathway and water channels flowing surrounded by the sea site fort wall right from the middle of the central pavilion till the main entrance of Bagh. Suggested for large gatherings for 700-1000 persons. The Moti Mahal is richly painted with scenes from Indian mythology, flora and fauna surrounded by two lush green gardens and swimming pool, with the water body and fountains seating Capacity 500-700 max. Sheesh Mahal (Hall of Mirrors) is embellished by the exquisite craftsmen ship of jewelers who have created wonders with mirror works and gold paintings. 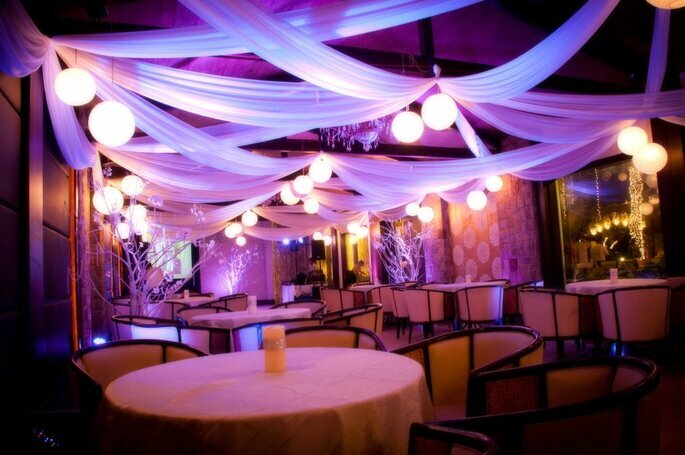 Which is now used for the welcome cocktails for the Darbar evenings seating capacity 75-100 max. 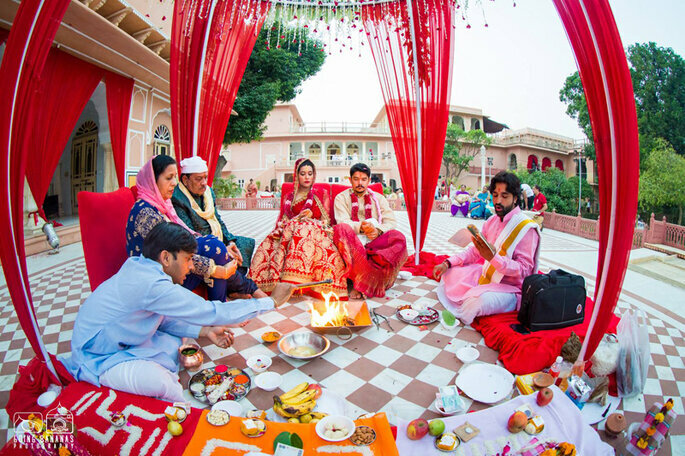 A Great Indian Wedding with all its elaborate pomp and ceremonies will find the requisite spectacular venue like no other, at Lebua Resort, Jaipur. From the moment guests are received at the intricately detailed latticework lobby, they are surrounded by sculptural grandeur and a rich visual vocabulary inspired by the culture of Rajasthan. Ceremonies and celebrations are held in the Adya Banquet Rooms – A glittering cloth chandelier travels the length of the room creating a sparkling venue. Guests can step out to the outdoor banquet lawn with lush landscape. Dining venues include Vajra Restaurant or Chakra Bar. The Bride and Groom can pamper themselves with special treatments at the Lebua Spa by L’Occitane with bespoke treatments and massages that combine flower essences and herbal aromas to restore the balance of forces within their body. Emerge with all senses awake to experience a new life. Their personalized service, along with their special wedding packages, ensures your celebration is a flawless, customized high-value affair. 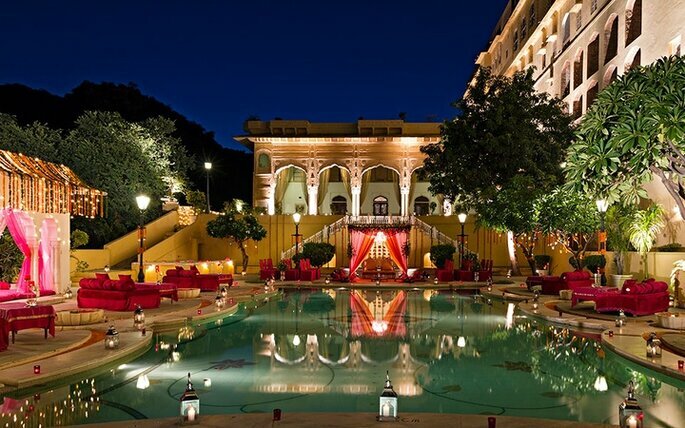 Samode Palace has been host to royalty, weddings, celebrities, artists, and the discerning travelers. Awaken to the quiet dawn, or have a cocktail on the terrace garden to the accompaniment of folk musicians. Run your fingers across the intricate story of an ancient mural on an uneven wall. Emerge from a gentle healing massage at the spa, or perhaps just sink into the lavish bed in your room. 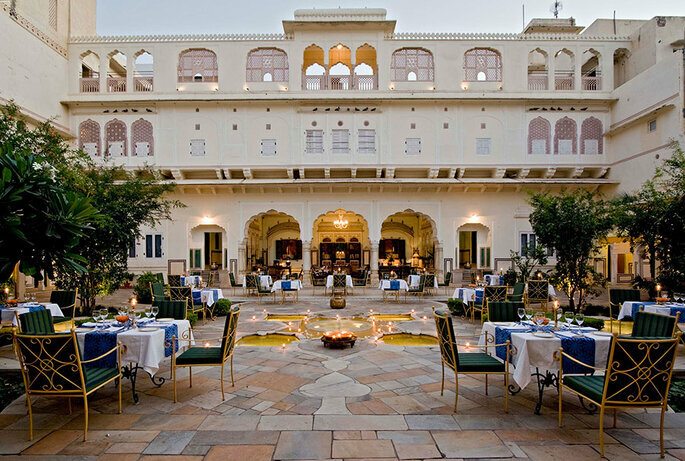 Samode Palace weaves its magic on you. 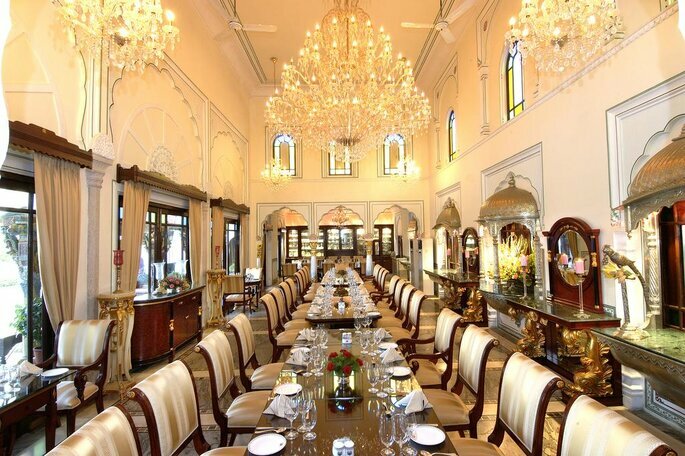 A splendid example of regal Indo-Saracenic architecture, the Palace combines the best of Indian and Mughal styles. The 475-year-old palace is a celebration of the senses, underlined at all times by contemporary luxury and the signature service of Samode hotels – a magical hospitality and rare courtesy. Shahpura has come to mean many destinations because of the many experiences it provides. Wedding guests are known to lose themselves in the maze of bougainvillea covered courtyards, connected by quaint narrow staircases and chance upon lounges adorned by charming arches, stunning mirror work, exquisitely painted walls and ceilings. 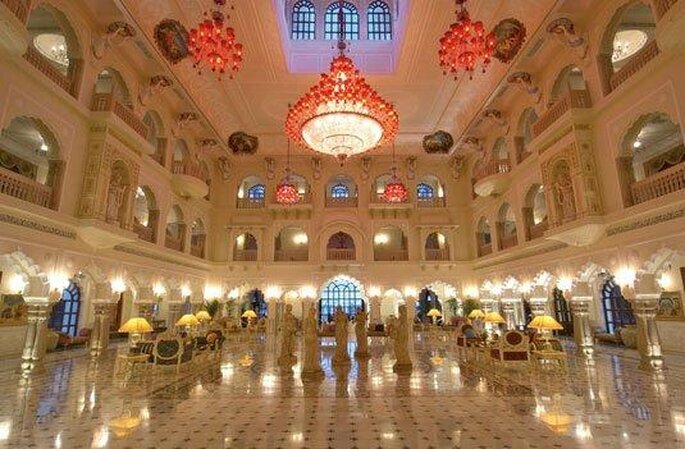 Royal suites and rooms surround the courtyards, each with their unique personality and décor. Under the impressive Shahpura Fort, the private balconies, restaurants and dining areas – open out to the sky on clear days and starlit nights. Enjoy your destination wedding with a fabulous venue. 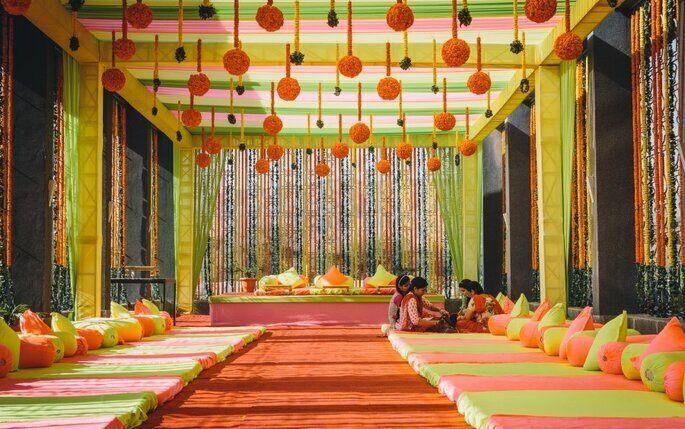 At the venue, there will be welcome girls who will be waiting to receive the group with showers of rose petals and the traditional Aarti and Tikka ceremony. The guests will also be received by the bride’s designated parents who will gesture a Namaste to the guests. The groom will alight from the horse and will be garland here. At this time the shehnai will be playing. This is considered as an auspicious sound, especially for marriages. The groom will be walked to the stage where the bride will be present from before. He will take the seat there alongside the bride. There will be a traditional ceremony of exchanging of garlands called “jaimala“. Post this the guest can proceed for the wedding ceremony. This will be on an elevated stage which will be illuminated. Here the couple will be married by priest amidst the chanting of the holy verses. 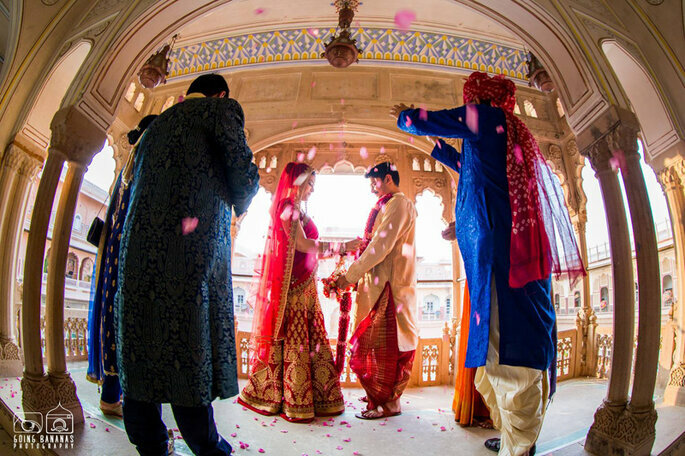 To make your special moment an unforgettable celebration, The Raj Palace provide personalized and innovative wedding services and complete wedding solution to your guests. Dreaming of a traditional Indian wedding, Hindu Wedding, Gujarati wedding, Bengali wedding, Indian Wedding Rituals traditions Hindu Gujarati Punjabi wedding, Christian wedding, Sikh Wedding and social celebrations of other religions they can help you to turn your dream wedding into a reality. Embark on a new journey together in style and leave all your worries behind. It is an experience, which will be unparalleled, take their word for it! 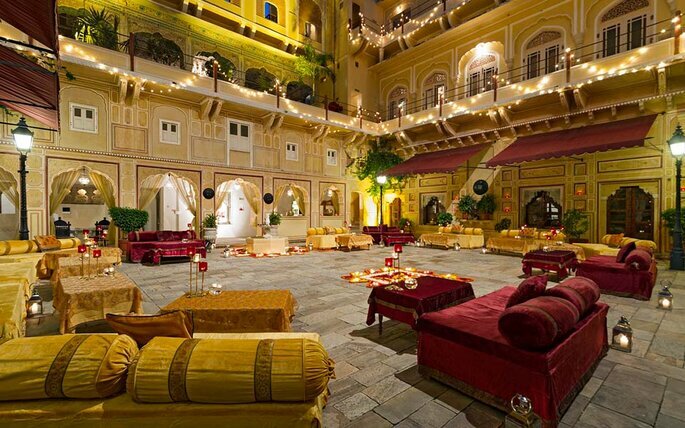 Raj Palace designs the most memorable day of your life with a touch of perfection. The weddings are made in heaven, so just make it an exotic lifetime memory. Imagine exchanging vows with your beloved on your wedding day with these beautiful wedding venues!